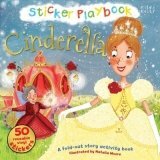 Sticker Playbook Cinderella is a double-sided play mat for kids aged 3+, featuring a beautifully illustrated story, learning activities and 50 reusable vinyl stickers. • Well-known rhyme to capture your child's attention when completing the learning activities. • Wonderful, bright illustrations by Natalia Moore, full of details for kids to find. • 50 reusable stickers for children to complete the activities, or just for fun!